Sunday mornings in our house are for Beatles tunes, dancing around and dirtying up the kitchen. Dear Husband is chief baker in our house. He’s naturally better at it. (What can I say, I’m a lucky girl!) 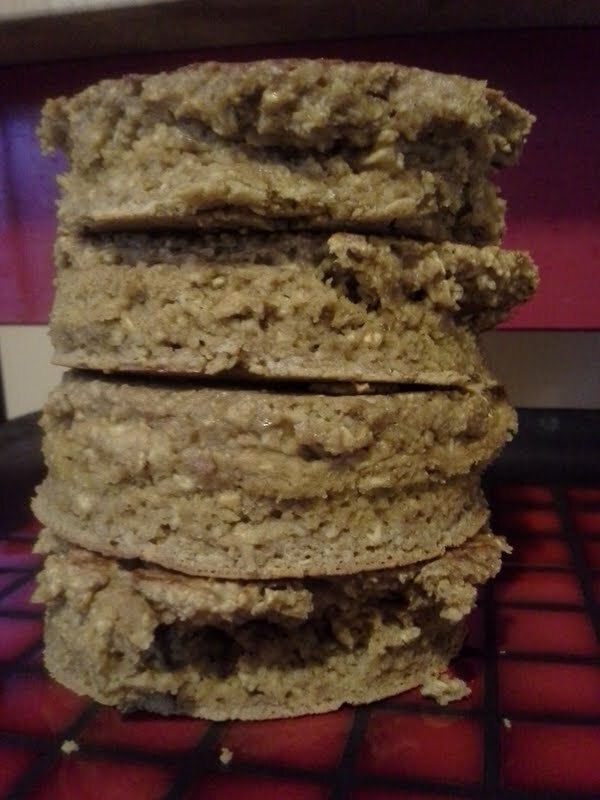 But these oatcakes are my brain child, and he was my sous chef. I very seldom use cane sugar in anything I bake, which in DH’s opinion is my greatest down fall. But– I just can’t do it! I fear “white poison,” it seriously gives me the creeps; and my friends just laugh when I refer it so. 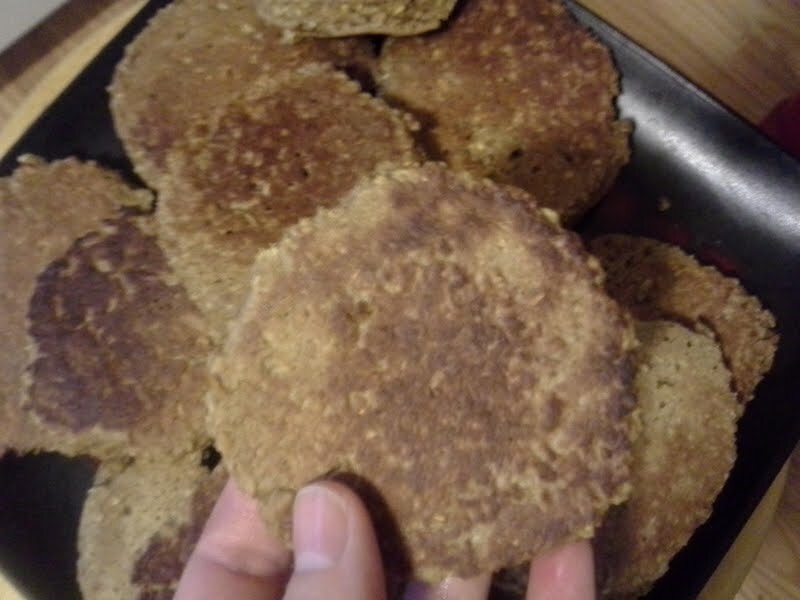 So, these hot cakes are sweetened with honey and a bit of maple, and the vanilla in my protein powder plays a major role. 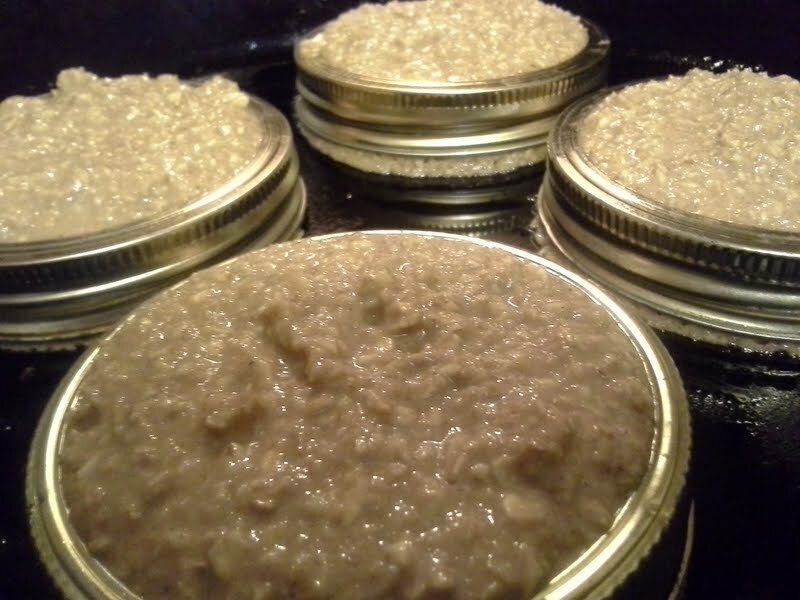 I’m always looking for different ways to get my daily oats in (as they are great for lactating Mamas) and and these work well for me to grab and go on work mornings; yet, are also delightful as a Sunday morning breakfast. Breakfast with the Beatles, that is! 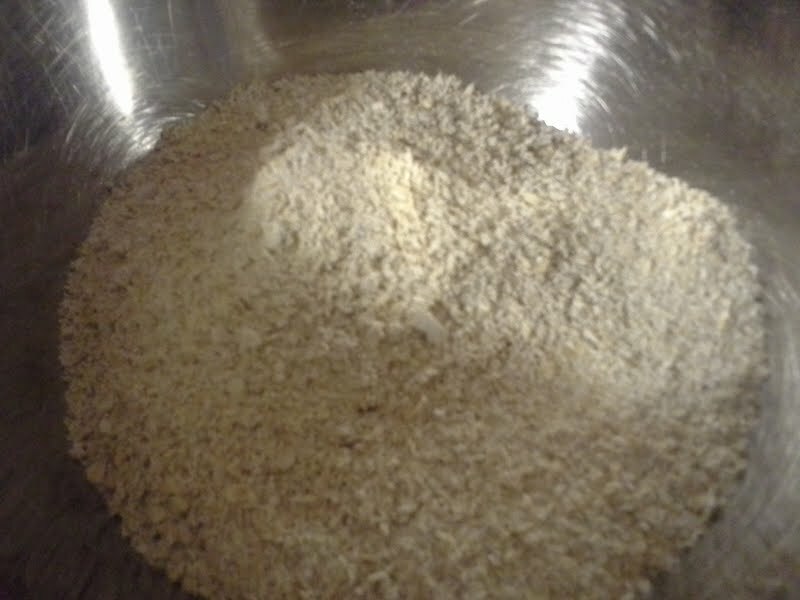 Pulverize oats in a food processor. About a minute or two will do. You are trying to get them down to a finer consistency. In a medium bowl combine all of the wet ingredients. Add the wet to the dry and mix. Let the mixture saturate for about 5-10 minutes. You want the oats to absorb some of the moisture. Don’t overdue it here, or the mix will start to set up, and it becomes trickier to work with. (I found that out the hard way. Had to wrangle a baby mid-griddle). 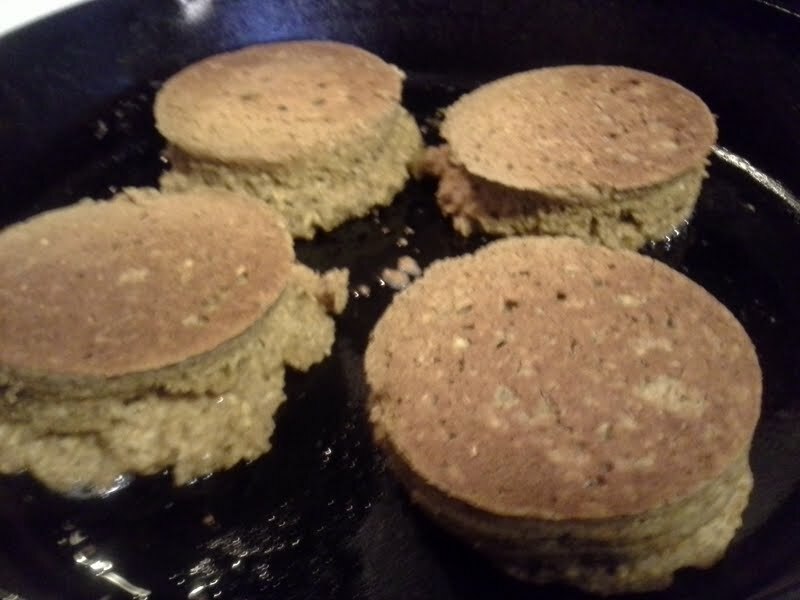 On the stove top on medium heat, spoon or ladle the mixture onto greased cast iron or griddle, as you would a pancake. I use coconut oil for this recipe because it’s great for high temps and its flavor lends itself very well to the recipe. Cook on one side until it becomes solid and able to flip. Times vary depending on thickness. Cook thoroughly on the remaining side and serve hot with butter. If you want to get mega-fancy and impress your friends with how creative and frugal you are, bust out your mason jars rings, grease ’em up, and throw ’em down! If you use this method, be aware that the cakes are thicker and take longer to cook. Once one side has cooked thoroughly you may removed the ring and flip. The rings can get hot, be advised. I made a combination of the ring cakes and plain pancake style. The pancake style turned out great and the ringed cakes were dense, chewy and made me want to head out for a hike with one in my ruck sack! I’d say this recipe yields a good bit. Maybe a dozen small if you’re lucky. These look delicious! Can’t wait to try them and add my own twist. Let us all know what you come up with! Apple syrup recipe?? 😀 Thanks! Yum! Thanks for sharing this on Wildcrafting Wednesday!